Jan Schwarze at Sunseeker Germany sends news of a €150,000 price drop on the 22.8m motor yacht Outsider. 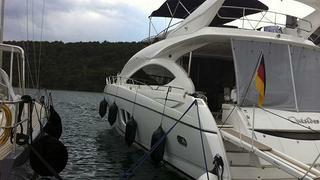 Built by Sunseeker in 2008, she accommodates eight guests in a master suite, VIP stateroom and two twin cabins. Outsider is powered by twin MAN engines giving her a cruising speed of 24 knots and top speed of 37 knots. Outsider is now asking €1.5 million.